Winner of the Codhill Poetry Award, Proof was also finalist for the National Poetry Series and the Nightboat Press Poetry Prize, as well as semi-finalist for the Akron Poetry Prize and the Felix Pollak Prize. It can be purchased online from SUNY Press or Amazon, or ordered through your local bookseller. To view the press kit, click here, and to download a discussion guide to the book, click here. 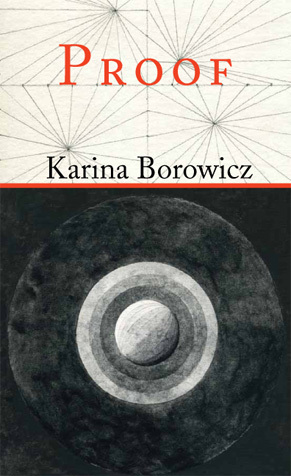 The poems of Karina Borowicz are startlingly transparent and deliciously opaque all at once. They are deeply rooted in the soil of the natural world but at the same time they communicate intimately with the everyday objects—breakfast dishes, lipstick cases, socks, radio towers—that underpin and adorn our lives. In language elegantly austere and deeply resonant, Borowicz plays sophisticated and understated musical riffs in celebration of what it is to be alive, sensitive, and mortal. I find myself reading Karina Borowicz’s Proof two ways: as a reader admiring her quiet, strange authority and vision, and as a writer asking: how does she do it? Because these are poems I’d like to emulate: poems whose questions and subtle declarations knit together planets and the past, the invisible and the seen, the living and the dead. In “Frozen Boot,” she writes: “I ran my hand along the frozen boot of the factory worker / because how else do you talk to statues.” I had no idea before, now I do. There’s puzzlement in these poems, and loneliness and needles and wasps, and in “Planet Kepler 22B,” there’s “the cave walls at Lascaux, where a herd / of red horses still circles in the darkness.” So we get the darkness of earth and the heavens, and somehow, Borowicz makes that light our way. “God decided suddenly to grow teeth,” writes Karina Borowicz in her spare new collection that observes those cataclysms requiring an especially lonely courage to notice. She witnesses them, at times with astounding tenderness, through a thin filter that allows only the right images through, and provides us with the guidance—not necessarily comforting—for beholding them. Whether its locus is in the wild or the eerie domesticity of “neighborhood,” each deft poem presents detail, however splendid, that spells trouble. But it is a trouble through which Borowicz knows how to travel, despite danger that is frequently heartbreaking. She does not disturb so much as an ant colony sleeping in winter, but shows us the terrifying loveliness of our vulnerability.